A graduate of The College of Mount Saint Vincent and Manhattanville College, Oona teaches English at Chatham High School in Morris County, New Jersey. 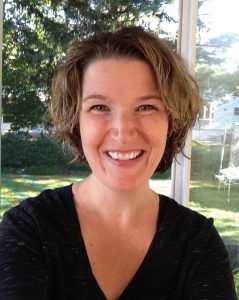 Since 1997, Oona has presented and collaborated with colleagues at the NCTE, CEL, and NJCTE conventions, and she is a guest blogger for NCTE and The Nerdy Book Club. She served as editor of English Leadership Quarterly from 2014 until 2018. Free professional learning is one of her greatest passions, and attending Nerd Camp Michigan, KidLitPalooza, and Nerd Camp Long Island inspired her to launch Nerd Camp New Jersey with several other members of CEL, ALAN and NCTE. She lives with her husband, four sons and a rescue dog in Bergen County, New Jersey. The award was presented at the Opening Session during the CEL Annual Convention in Houston, Texas. Purpose: The CEL Teacher-Leader of Excellence Award recognizes a classroom educator who leads the way of literacy instruction by sharing his or her work with others at local and/or national levels. Award Criteria: NCTE/CEL members are encouraged to nominate an exceptional teacher-leader who has had a strong positive impact on their school/district and/or state through work that has focused on exceptional contributions to teaching and local leadership practices (i.e., team building, coaching, and curriculum development). Award Specifics: The recipient receives a certificate, which is presented at the CEL Annual Convention. Nomination Materials: All nominations must contain the Nomination Form, at least two letters of recommendation, and the candidate’s curriculum vitae. Judging: The CEL Award Committee determines the recipient from the nominations submitted within the calendar year. For full consideration, nominations must be received no later than March 1. Candidates not selected for the year in which they are nominated will receive consideration for the next two years.